Koni adjustable shocks and struts allow the driver to select a variety of rebound and compression damping choices. This allows you to pick the best performance level for your needs at any moment. Whether you're dialing in your track car or finding the perfect blend between stability and comfort. While Koni is now legendary for performance, Koni adjustable shocks and struts were originally designed with ordinary drivers in mind, the adjustments allow you to compensate for wear on the damper over time. That gives Koni adjustable shocks a much longer lifetime than non adjustable shocks. The most popular Koni adjustable shocks are from the Koni Sport Yellow line, but many Koni Classic Red and Black shocks are manually adjustable, along with coilover kits, RV shocks, race shocks, and more. There are three different adjustment procedures for Koni adjustable shocks that are conveniently grouped by part number. To determine what series your shock comes from, just look at the first section of the part number. The adjustment is made with the shock fully extended. 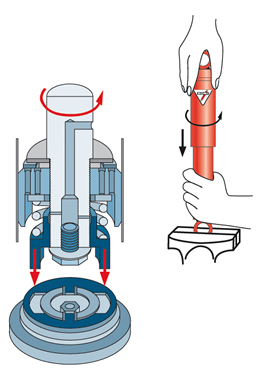 Hold the damper body by hand where the piston rod emerges form the cylinder. Push the button carefully, by hand, and hold it in that position (figure 1 & 2). (Do not use any device, other than by hand to depress button). Fig. 2: The handy adjustment button. 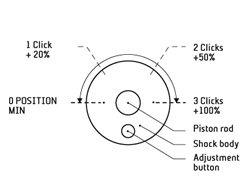 Depress the button while turning clockwise to give increased damping forces. Be sure the adjusting button fully springs back into position. 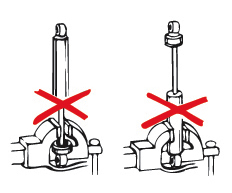 As long as the button is depressed, do not turn the piston rod further; otherwise correct adjustment will be disturbed. As soon as the button has made its complete return, the piston rod bay be turned freely. The damper can now be refitted. Remove the shock absorber from the vehicle and hold it vertically with the lower eye or pin attached in a vise. Use clamp plates to prevent damage. Fully collapse the shock absorber, at the same time turning the dust cap or piston rod slowly to the left (counterclockwise), until it is felt that the cams of the adjustment nut engage in the recesses of the foot valve assembly. Some shock absorbers include a bump rubber concealed under the dust cover and it must be removed prior to adjusting. Fig 4: Rebound adjustment (approximate force). Listen for the clearly distinguishable clicks, each of which marks an adjustment position. 26 series range limited to two clicks. 28 and 30 series range in three clicks. The damper may have already been adjusted. Therefore check whether the shock absorber is in the adjustment position or not by keeping it collapsed and gently turning it further to the left counting at the same time the half turns until a stop is felt. Stop turning then and do not use force. 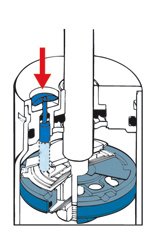 Keeping the shock absorber collapsed, make 1 half turn (180 degrees) to the right (clockwise). In case of prior adjustment add the number of half the turns previously found. The total range is about 5 half turns. Pull the shock absorber out vertically without turning for at least 1 cm to disengage the adjusting mechanism. 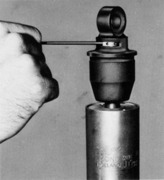 The dust cap or piston rod may now be turned freely. Externally Adjustable. These dampers can be adjusted, literally at the turn of a knob, a technique borrowed from Formula-1 racing where KONI dampers have dominated the field for years. One can switch back and forth, in most cases in a matter of seconds, from a comfortable "touring" setting to a more firmer setting for a sporty drive. By means of a knob damping forces can be altered to driving conditions or personal preferences. Figure 1: Move pin left or right to increase rebound forces (counter-clockwise) Rebound - Insert a pin into the slotted adjuster located at the top eye (figure 1). Moving the pin from left to right (counterclockwise) will cause the forces to increase. From the minimum or factory positions, there are 12 possible sweeps of adjustment ( 1 sweep equals 1/4 turn).